Poll: What of you think of this card? Join the discussion on our forums! Come discuss Unwilling Sacrifice over in our dedicated Unwilling Sacrifice discussion topic. Uses the same art as Trogg Hate Minions! i sacrificed my Devilsaur Egg that i discovered from Journey Below against opponent's Ragnaros. I wonder if somebody else got a bigger value out of this card yet. some egg zoolock coming next expansion? I wish they would forget about discard, but I like a few of the most recent cards including Treachery, Defile, and Gnomish Vampire. Even Bloodbloom from Un'Goro is a lot of fun. I do wish Warlock had a decent healing immune card or two . . . 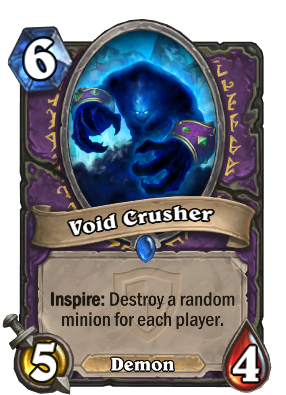 Worthless trash when Warlock is at its worst. Blizzard really is letting Warlock down so far. This is a bad Deadly Shot and Deadly Shot is only fringe playable. Sure, you put it in a deck with egg type effects, but you only have so many of those effects. The Pterodox is in Zoo, but Zoo is in a bad spot now and i'm not sure anything is really looking to change that with the reveals thus far. Bad/Fringe Playable. Ravenous Pterrordax made it into Zoolock, no reason this won't. Blastcrystal Potion is still better in control versions of Warlock but this is a nice removal in aggro. What an amazing brawl card! So.... it's a worse Deadly Shot. You warlocks enjoy that. Consider hunter and warlocks are different classes who have different ways of play and warlock can easliy benefit from dying minion, yes, yes they would. Heck, hunter deathrattle decks would probably love this card even more than Deadly shot. But why not just play Blastcrystal Potion? 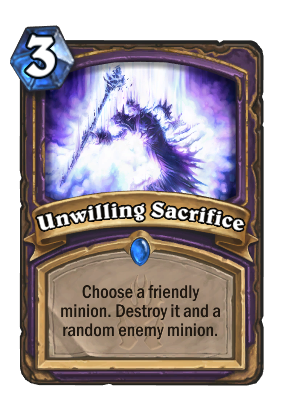 It only costs 1 more, lets you target the minion you want to kill and you don't have to sacrifice one of your own guys.